This means that for March 2015, carbon dioxide levels across the globe remained at 400 ppm* for the entire 31-day period with no increase in global mean temperatures as measured by RSS satellites. NOAA began tracking its own carbon dioxide (CO2) levels in May 1974 concomitantly with the Scripps Institution of Oceanography. The first measurement of atmospheric CO2 levels was started by C. David Keeling of the Scripps Institution of Oceanography in 1958 on Mauna Loa, Hawaii. 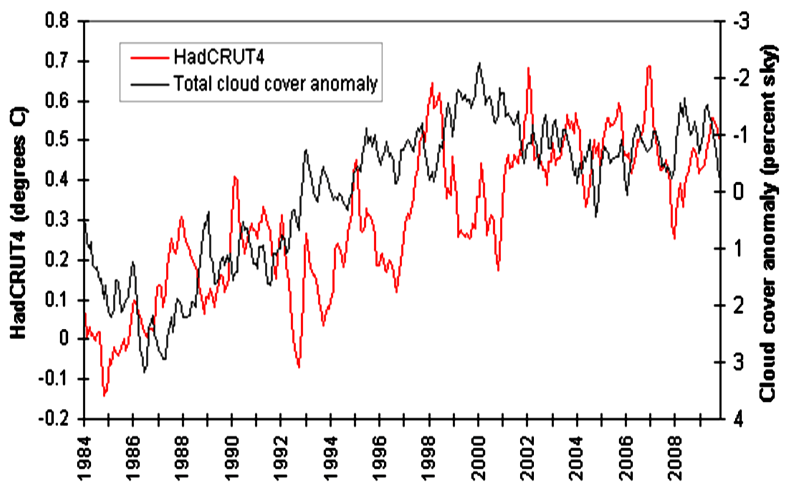 Prior to that, NOAA has relied on ice core samples and sediment for earlier reconstructions of atmospheric CO2 levels. The International Energy Agency, however, reported on March 13 that global emissions from the burning of fossil fuels stalled in 2014, never rising above 2013 levels. According to NOAA, the March CO2 levels were recorded from 40 different sites in both hemispheres, with some of them being situated on cargo ship decks, remote islands, and other locations not close to areas that emit large amounts of CO2. The global average is then computed based on the samples sent in from these various locations to NOAA’s Earth System Research Laboratory in Boulder, Colo.
“Not only does the RSS satellite dataset show no global warming from December 1996 to April 2015, which is more than half of the entire satellite record,” Monckton writes, “But the warming trend since 1900 is roughly 0.8°C per century, well within natural variability.” NOAA also expects that the higher CO2 levels will remain that way through May, but drop to lower levels as plants in the Northern Hemisphere begin to bloom, utilizing the CO2 for photosynthesis in the spring and summer. According to some climate scientists, an increase in carbon dioxide levels as seen in the 20th and 21st century should cause a subsequent increase in global temperatures. Even the IPCC’s prediction of 4.8°C warming by 2100 is “over four times the observed real-world warming trend when humans began influencing the climate in 1950.” Even the oceans, according to the 3600+ ARGO bathythermograph buoys, are warming at a rate “equivalent to just 0.02°C per decade, or 0.23°C per century, well within the normal rate of warming,” according to Monckton. In a nutshell, what we’re observing and what is being predicted simply aren’t aligning (Fig. 4). Though CO2 is attributed as a potent greenhouse gas that will be lingering around for hundreds of years, the inescapable truth is that the man-made global warming theory simply fails at every observable test. El 4 de mayo de 2007 el Panel Intergubernamental para el Cambio Climático publicó el resumen político de su cuarto informe. En él se advertía que había que actuar con rapidez para evitar el cataclismo climático reduciendo las emisiones de dióxido de carbono, especificando que nos quedaban sólo ocho años para actuar antes de que el proceso fuera irreversible y las temperaturas subieran dos grados centígrados hiciéramos lo que hiciéramos. Si el organismo de la ONU fuera coherente con aquella predicción, la lógica le obligaría a abandonar toda insistencia en reducir las emisiones y se centraría en cómo podríamos frenar las consecuencias de un cambio climático que considera irreversible. Sin embargo, dado que no ha actuado ante la creciente divergencia entre las temperaturas reales y las predichas por sus modelos, no parece probable que haga siquiera una breve declaración en la que reconozca que se equivocó en 2007. «Ojos que no ven, corazón que no siente». En Estados Unidos, el refranero dice «fuera de la vista, fuera del pensamiento» («out of sight, out of mind»). Bajo tan solvente principio científico, el gobernador de Florida, el republicano Rick Scott, ha prohibido al Departamento de Protección del Medio Ambiente de ese estado usar una serie de expresiones como «calentamiento global», «cambio climático» o «subida del nivel del mar». Con la nueva orden el estado de Florida queda a salvo de huracanes, sequías e inundaciones, lo que es especialmente importante en un territorio que tiene 1.900 kilómetros de costa y 11.600 kilómetros cuadrados de bahías y estuarios y en el que tres cuartas partes de la población viven en regiones costeras. La política de Scott no es oficial. El gobernador ha desmentido la información, desvelada por la organización sin ánimo de lucro Centro para el Periodismo de Investigación de Florida. «No es cierto», ha declarado Scott. Lo mismo han hecho los portavoces del Departamento de Protección del Medio Ambiente. 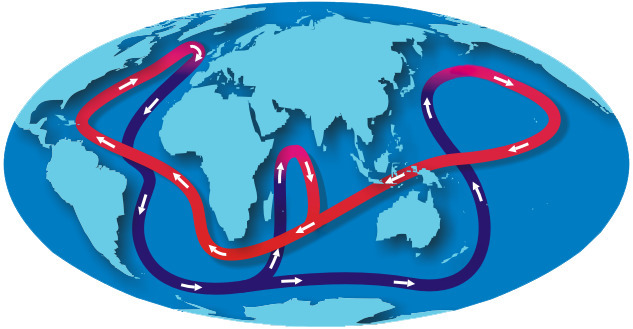 The ocean conveyor moves heat and water between the hemispheres, along the ocean bottom. It also moves carbon dioxide. Most of the concerns about climate change have focused on the amount of greenhouse gases that have been released into the atmosphere.But in a new study published in Science, a group of Rutgers researchers have found that circulation of the ocean plays an equally important role in regulating the earth’s climate. In their study, the researchers say the major cooling of Earth and continental ice build-up in the Northern Hemisphere 2.7 million years ago coincided with a shift in the circulation of the ocean – which pulls in heat and carbon dioxide in the Atlantic and moves them through the deep ocean from north to south until it’s released in the Pacific. “missing heat” to be found. bands except the Antarctic and to a less extent 30S-60S. cloud cover or the shift from low level cloud.